By combining varying quantities of grapes harvested weeks apart, PhD student from the National Wine and Grape Industry CentreMr Rocco Longo hopes to create a full-flavoured wine with an alcohol content of less than nine per cent. The project is a collaboration between CSU and the University of Adelaide, and is supported by the Australian Grape and Wine Authority. “Low alcohol wine varieties have a bad reputation for taste; they can taste like water because of a lack of full-body and full-flavour characters caused by a loss of aroma compounds,” Mr Longo said. Demand for low alcohol varieties is being driven by a number of factors including climate, culture and, in some countries, taxes. “The changing climate means the amount of sugar in wines is increasing and more sugar means more ethanol,” Mr Longo said. “Winemakers are harvesting two weeks earlier than they were 20 years ago. It is becoming difficult to find the optimum level of sugar, and acidity and aroma compounds. “Higher alcohol content also results in higher taxes for the consumer. And as concern for Australia’s high rate of alcohol consumption increases, we are sure consumers will accept reduced alcohol wines. 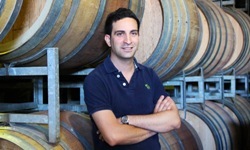 Mr Longo worked with Lowe Wines in Mudgee, New South Wales assisting in low alcohol wine production. A white and red variety of the low alcohol wine is scheduled to be available by June.